Anker is all about making products that are just as good as rival devices, but at a fraction of the price since Anker doesn’t dump tens of millions of dollars into advertising. Instead, the company relies on word of mouth and good reviews on Amazon, so you know its products have to be top-notch. The Anker Roav HydroClean Electric Pressure Washer is one of the newest additions to Anker’s product lineup, and it’s already making waves. 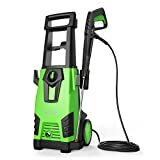 You can expect to pay hundreds of dollars for a similar 2,100 PSI power washer from any other company, but the Roav model will only cost you $118.99 if you use the coupon code ROAVWW22 at checkout.